Apparently we are due for one of the coldest winters ever; don’t they say that every year though? Either way it’s the same story for me; thick socks, snuggly jumpers and consuming an astonishing amount of cheese. When you’re having to defrost your car windscreen every morning the thought of coming home to a nice salad just doesn’t quite cut it. What is needed is lots of stodge; carbohydrates, cream and cheese. Dauphinoise is a classic choice but it’s not quite a meal. So to fulfil this instinctive desire for filling food, on a budget for four people, this gnocchi with broccoli, toasted walnuts and blue cheese sauce is perfect. Start by getting a frying pan on a low to medium heat and adding a glug of oil or knob of butter. Add the onion and fry slowly for around 20 minutes or until softened but not browned. While the onion is frying get another small frying pan on a medium to high heat. Add the chopped walnuts and toast them in the dry pan for a few minutes until you can smell they are toasted. Watch them carefully though as they can burn easily. Put to one side when done. When the onion is around five minutes from ready bring a large pan of salted water to the boil. Add the broccoli and boil for two to three minutes. When the onion is soft, pour in the cream and stir frequently until it just starts to simmer. Add the gnocchi to the pan with the broccoli and continue to boil for one to two minutes more or until the gnocchi floats to the top. 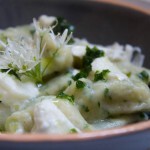 Crumble the blue cheese into the cream sauce, reduce the heat to its lowest setting and stir frequently. Drain the broccoli and gnocchi and put to one side. Ensure the cheese has melted into the cream and then add plenty of black pepper. Taste the sauce and add a little salt if needed; it will depend how salty your cheese is. Serve the broccoli and gnocchi up into bowls, pour over the cheese sauce then top with the toasted walnuts. I would count this meal as quite a luxurious one. The gnocchi will always be pillowy and filling but the broccoli adds some welcome green and freshness. The blue cheese sauce is just as I like it; a hint of blue not a full blown tongue assault mouthful. The toasted walnuts add a bit of protein but more importantly a nice bit of crunch. Not bad for a very reasonably priced, generous meal for four which should only take around 30 minutes to prepare. 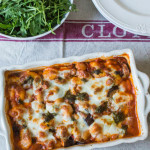 Don’t forget to listen in this Saturday at around 8.20am to hear me talking about this recipe on BBC Radio Berkshire. It’s been raining here for a few days and the temperature is getting chilling. I know it’s probably nothing compared to where you are. But I’m sure this gnocchi will warm me up and comfort me just as well. 🙂 Thanks for sharing. We are supposed to get our first real snow this weekend so we are really turning into comfort food mode. 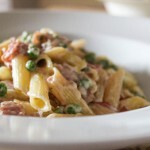 I love blue cheese sauce – looks like a great pasta dish. Caroline, I have had mixed results with gnocchi — and certainly have never made my own. I’ll have to give it another try. P.S I recently lost 1000 subscribers and I have no idea how 🙁 If you were subscribed, please resubscribe if you can, it would be much appreciated! To me nothing is more comforting than a big plate of delicious gnocchi. Love the way you have used broccoli. Healthier than meat! Looks like deliciously frugal comfort food for this chilly weather. I have some purple sprouting outside, hardly a glut but could pick a handful for this and some leftover gorgonzola in the fridge so this is looking very tempting. Love the term, “glug” of oil! Haven’t heard that word used for a while, and it’s such a nice descriptive word. Anyway wonderful recipe! And I agree at this time of the year I want hearty, not dainty. Good stuff – thanks. even there’s no snow and hot here, i would still love to dig in to your pasta! Se ve muy rica la combinaciòn me gusta mucho el bròcoli llevo un trozo,abrazos. for some reason, i always think of gnocchi as fancy-shmancy, and this is super elegant. bravo!